A United Launch Alliance Atlas V rocket blasts off with the NROL-79 satellite on March 1, 2017 from Vandenberg Air Force Base in California. A new American satellite soared into Earth orbit today (March 1), kicking off a reconnaissance mission that's shrouded in secrecy. The NROL-79 satellite launched into space atop a two-stage United Launch Alliance (ULA) Atlas V rocket at 12:49 p.m. EST (1749 GMT) today, rising off a pad at Vandenberg Air Force Base in California. 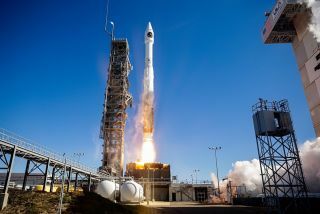 After lifting off, the Atlas V headed south, hugging the coasts of California and the Mexican state of Baja California as it rose into the sky. If everything went according to plan, the rocket reached Mach 1 — the speed of sound, about 767 mph (1,234 km/h) — 81 seconds into flight, according to a ULA mission-description video. The booster's main engine cut off 4 minutes and 3 seconds after liftoff, and the rocket's two stages separated 6 seconds later. The payload fairing protecting NROL-79 was jettisoned 4 minutes and 27 seconds after launch. The ULA video ends there, however. It is a classified mission, after all. NROL-79 was originally scheduled to launch on Dec. 1, 2016. But a series of wildfires at Vandenberg in September, and then an issue with the Atlas V's upper stage, pushed the liftoff back three months. Today's launch was the 70th for the Atlas V, which made its spaceflight debut in August 2002. All of these missions have been successful, ULA representatives said. The liftoff was also the 35th for the Atlas V's 401 configuration, which does not incorporate any strap-on solid rocket boosters (SRBs). Other variants of the Atlas V can feature as many as five SRBs.